The Resource Guide is curated by the Taubman Health Sciences Library at the University of Michigan for Center for International Reproductive Health Training partners, students, faculty, clinicians and scholars. The information sources presented in this resource guide are openly accessible. The resources on this site have been created to enhance students’ training in Family Planning and Comprehensive Abortion Care. Below are brief guides for faculty instructors and for students on how best to use the videos and other resources as part of their clinical training. 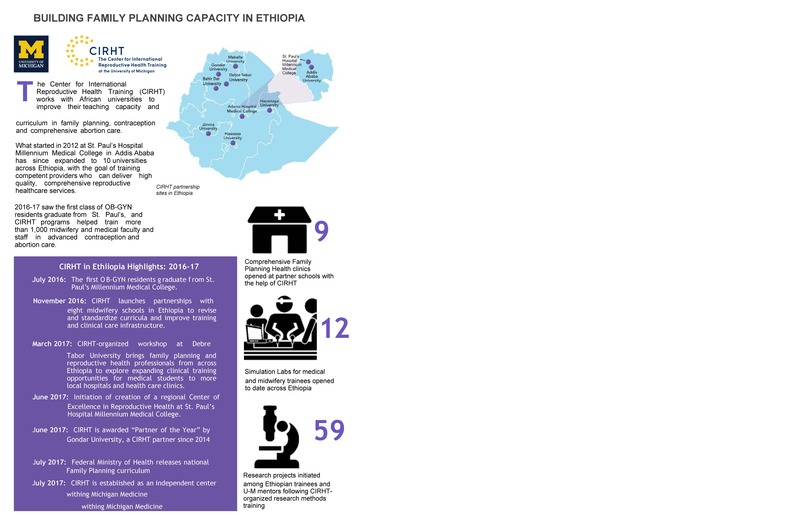 These course elements have been developed by faculty from UM-CIRHT partner universities in Ethiopia. These course elements have been developed by faculty from UM-CIRHT partner, The University of Rwanda.